Computer Science for Fun - cs4fn: Who Built The First Modern Computer? Most people think it was an American team that built the first working computer. In fact, the world's first programmable digital computer was built in secret by the British in the Second World War at Bletchley Park. Bletchley is famous as the place where the Enigma cipher machine was broken: a task which they performed efficiently using a machine called a Bombe. However, the most important thing that Bletchley did was neither breaking the Enigma code nor creating the Bombes. Professor Nigel Smart, Head of the Department of Computer Science at the University of Bristol and an expert on cryptography tells us more. The Enigma machine was used by the Germans to encrypt low level secret communications, such as battlefield communications or communications to U-Boats. It was a mechanical device which operated on letters. An operator encrypted a message using a typewriter like interface and then the encoded message was sent using Morse Code. 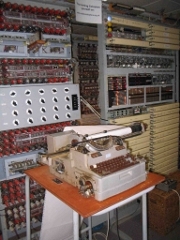 The Lorenz machine was the machine used by the Germans for more strategic communication. It took as input a message encoded using what is called a Baudot code. Baudot code had been used for years for teleprinter communications, and is essentially a conversion of the message into binary (a "binary encoding"): 1s and 0s. The Lorenz cipher would then encrypt the message to produce another binary encoding of the message (but now a binary encoding of the encrypted message). Since the Lorenz cipher worked on binary encodings it could process information much faster than the Enigma machine, since no one needed to type a message into the machine. The Lorenz cipher was used by Hitler to communicate between his centres of command. If the Allies could break into the Lorenz information they would know what Hitler and his followers were actually thinking. In breaking the Enigma machine the British had the advantage of actually having an Enigma machine which had been recovered by the Polish. 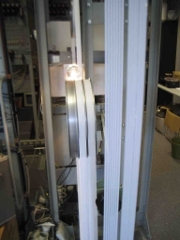 When breaking into the Lorenz machine though, they did not have a clue how it worked at all. To make it worse still, picking up the airborn traffic was harder. Intercepting the remote binary signal produced by Lorenz machines was much more difficult than recognizing the Morse code used by the Enigma. However, by setting up listening stations the British recovered enough messages for the British cryptographers at Bletchley to actually work out exactly how the Lorenz machine worked, without ever seeing one. It was an amazing intellectual feat. The cryptographers at Bletchley also worked out how to break the machine using subtle statistical weaknesses of the machine. Unfortunately, to actually exploit the weaknesses they needed to process a large amount of data. A lot of calculations would need to be performed on a given target message quickly. After all cracking a message years after it was sent wasn't a lot of help. This meant that a machine would be needed to exploit the weaknesses found. To solve this problem Tommy Flowers, an engineer who worked for the post office, designed a machine which worked on the digital data stream of the Lorenz traffic and could carry out the statistical tests needed to find the key. One of the things he needed to take into account when designing the machine though was that different tests might be needed to be used at different times. As a result he designed the machine in a flexible way so that it could carry out whatever tests ended up being needed. So Colossus was able to process digital data. It was also able to perform different tasks, including ones that were not envisaged by its designers. Even better you could use Colossus to perform other calculations that were not necessarily related to code breaking. That's a feature which distinguishes it from the Bombes, and a feature which makes its claim as the first modern computer. In short, Colossus was a programmable digital computer just as modern computers are. One distinct difference between Colossus and modern computers though is that Colossus was programmed by someone connecting various pieces of the machine together using wires. A modern computer's program is stored with its data, inside the machine. This improvement did not come until a machine called the Manchester Baby in 1948. The Colossus allowed the breaking of the most important German communications and so allowed the Allies in the last years of the war to see inside the minds of the Nazis. Apart from its code breaking use the Colossus is important because it was the first digital computer to be able to be used for different tasks. It was therefore the first machine to partially fulfill Alan Turing's pre-war idea of a Universal Machine which can be programmed to compute anything. Many of the Bletchley team went onto build the first post war computers in the UK, at Manchester and Cambridge. Many of the US computer pioneers also had secret access to Colossus during the war. However, the Colossus' role has only recently been fully recognized. The machines were all apparently destroyed at the end of the war, and their existance was kept secret until only recently. Of the 10 000 people who worked at Bletchley none spoke of what they had been involved in or even of Bletchley Park's existence for 30 years when its existence eventually became public knowledge. The ideas behind the Lorenz cipher are very similar to the type of stream ciphers used to encrypt large data quantities in modern devices, such as your mobile phone. The ideas behind Colossus which broke the Lorenz cipher had to be kept secret because govenments continued using ciphers based on the same principles as Lorenz for a long time. Luckily the early computer pioneers really could keep a secret. Was the first computer a Bombe?